Trying to find the perfect engagement ring can be a difficult task. There are so many different kinds of engagement rings on the market, including different styles, designs, and levels of intricacy. Some engagement rings have stones or gems as the main feature, while others focus on the intricate designs in the band itself. For those who prefer beautiful, delicately designed engagement rings that can be custom-designed just for your bride-to-be, a filigree engagement ring could be the perfect way to go. These rings incorporate many different designs and styles to match your specific needs and desires in the perfect engagement ring. Filigree engagement rings come in many different sizes and shapes, including different designs and varying levels of intricacy in those designs. These rings, while beautifully decorated, can also fit any budget while still maintaining a high level of class and they will be sure to get the right answer to your proposal. 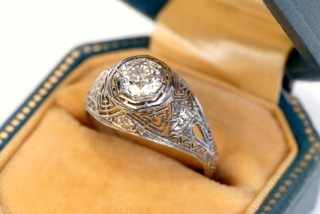 First of all, it is important to understand exactly what it means to look for in a filigree engagement ring. Filigree engagement rings are rings that are decorated with intricate, ornate designs on the band or on the center part of the ring itself. These designs are typically symmetrical or figural designs, often of your own choosing. You can incorporate hearts, flowers, leaves, names, dates, or any other design imaginable onto your filigree engagement ring. The endless possibilities for design techniques are what makes these rings so desirable for engagement rings. Filigree rings are created using metalworking, and for this reason many filigree rings are vintage or antique. However, they can still be made and are often sold as popular engagement rings. Each ring can be custom made so that it is perfect for your bride. Because of the ornate decorations embedded in the ring itself, these engagement rings are usually of a medium to thick size. Smaller ring sizes do not accommodate well to the designs that high-quality filigree rings require, although for simpler designs a smaller band may be used. There are several different types of filigree design styles that can be used for these rings. The simplest design is that which accents a centerpiece, such as a gemstone on the ring. These designs are usually only used on the arch of the ring, which adds an accent to a particular part of the ring itself. Since this design is only used on a portion of the ring, this is usually the least expensive option for those who choose the filigree engagement ring. However, even this style can be very personalized, since you can choose which design to use on the ring and how a centerpiece is accented. Another option for the filigree engagement ring is to have a more elaborate decoration on the ring band. This option can open other possibilities for the intricacy of the design, since the jeweler has more space to decorate. More complex filigree designs often use more than one pattern choice, overlaying them in such a way as to add beauty to the ring. These complex designs are often very popular, but may sometimes take away from the centerpiece. For this reason, these rings often do not have gem stones in the center, but rather use the beauty of the designs themselves to show off the ring. This style can be very attractive even without a gem, since the designs are so detailed that they keep the attention of the viewer in awe. Some filigree engagement rings also utilize a couple of different metals to enhance the beauty of the ring. This type of filigree is called a multi-tone filigree ring, and these incorporate two or more metals of different colors to enhance the designs. By overlapping and interweaving these different colors, the rings appear to be even more complex than if they were made of only one color. Artists often use this technique without a center stone as well, since the designs can be very appealing while standing alone. Center stones or other centerpieces can often distract the viewer from the beautiful metalwork created by using the multi-tone model for the filigree ring. Just like other types of engagement rings, the filigree ring can vary greatly in price. The price of any filigree ring depends on several factors. First of all, the intricacy of the design has a lot to do with how much the ring will cost. The more intricate the design, the higher the price will be. This is because these rings take longer to make and are much more complicated. In order to have a high-quality filigree ring with excellent definition in the design, the cost will have to increase. Likewise, simpler designs often have lower price tags. However, the price of a filigree ring can also vary depending on whether or not a gem is used in the ring, and how big the centerpiece is, if there is one. Using more expensive gems like diamonds will increase the price of the ring, as well as the size of the gem itself. Synthetic diamonds or imitation gems are typically cheaper than real stones, and often look the same to the naked eye. This is an important factor to consider when thinking about purchasing a filigree ring. These rings can fit any budget, but there are these things to consider. The more intricate the design, the higher the cost. Gems can also add to the price of your ring. Many jewelers only stock a few filigree rings at a time, so be sure to check out several different local jewelry shops before making a decision on which ring to purchase. Also, these rings are available at online jewelry stores, but always beware of the dangers of buying such a ring online. Since they are so intricately designed, it is important to be able to see the ring before making a purchase. Often, online stores will not show pictures that are clear enough to make this kind of decision. Always inspect your ring before purchasing one to be sure that you are satisfied with the work done. If you are having a filigree ring custom made, do not hesitate to ask questions and make sure that the ring is exactly the way you want it before making a final commitment. Caring for these rings can be tricky, especially since they are so beautifully designed. Your jewelry should be able to show you how to clean these rings, and they do require extra care to maintain their original beauty. A small bristle brush is typically the best way to clean in between the designs of the ring. Be sure that your brush is gentle, since any harsh rubbing against the metal can cause damage to the ring. Do not try to dislodge debris with harmful objects. Use only a small bristle brush and a soft towel designed for jewelry to avoid damaging the ring or its designs. Often jewelers will offer cleaning services for a fee, and this may be a good option if you feel uncomfortable cleaning the ring yourself. Whichever design you decide on for your filigree engagement ring, it is guaranteed that your fiancee will fall in love the moment she sees the beautiful designs on her ring. Whether you decide on a simple or a complex ring with gems and overlapping designs, the filigree ring is never a bad choice. This ring can fit any budget and will be sure to make her say “I do.” Visit a local jeweler for more information on these astonishing rings and choose your personalized design just for her. She will be sure to love it.